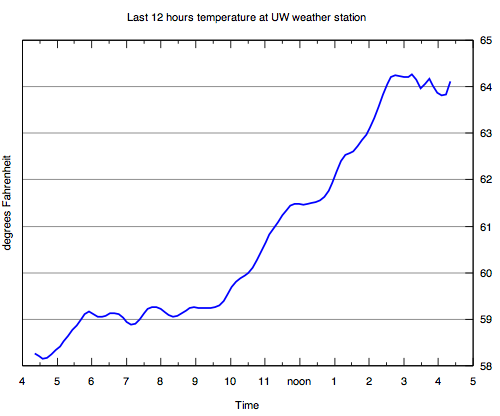 The Python script downloads the last 12 hours worth of temperature readings from the University of Washington weather station. The readings are available as a csv file. The script then extracts the useful information from the csv file and converts the times into a format that gnuplot understands. Also, it deals with time zone issues. It then feeds the data through gnuplot to draw the graph and outputs the graph to the user. It also caches the graph to prevent unnecessary strain on my or the weather station’s server. The "-" means the data file will be given on stdin, but you could also use a filename here. The using 1:2 tells it to use columns 1 and 2 for the x and y data, respectively. Then smooth bezier tells it to smooth the data instead of just connecting all the dots. Color is controlled by lt 3 and line weight by lw 2. Counterintuitively, notitle eliminates the key. 13 set format x "%l%p"
22 set ylabel "degrees Fahrenheit"
23 set title "Last 12 hours temperature at UW weather station"